Johnson, Pereira » Roger Perron Inc. This letter is to commend you on the fine job you did remodeling my Hollywood home. You were extremely well organized and responsive to my requests as the job progressed. 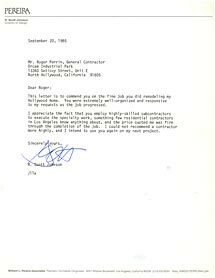 I appreciate the fact that you employ highly skilled subcontractors to execute the specialty work, something few residential contractors in Los Angeles know anything about, and the price quoted me was firm through the completion of the job. I could not recommend a contractor more highly, and I intend to use you again on my next project.